If you love cheese, warm melted cheese that is, provoleta is a must have pre-meat dish for an asado. 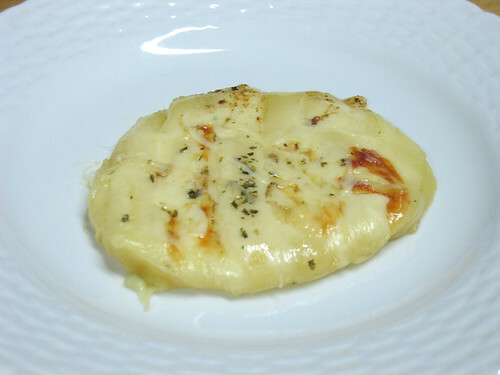 Provoleta is semi-hard provolone cheese in cylindrical form. For asado it is sliced about 2 cm thick and cooked on the grill until melted with a crispy exterior. Both sides are typically seasoned with a generous amount of oregano or other herbs and spices. A light sprinkling of dried red chili flakes may be included for the brave. 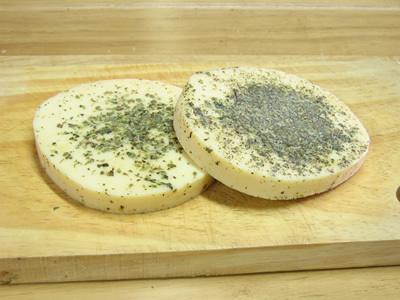 The herbs and spices are pressed well onto the cheese in order to prevent them from falling of during the cooking process. The true method of cooking provoleta is to place it directly on the grill. This method can be quite difficult and takes a bit of practice to master. If done incorrectly, the cheese can melt right through the rack and onto the coals leaving you with a gooey mess on the grill; not fun to clean. If you are quick enough to pull off the grill before it falls, you’ll just have a puddle of melted cheese to serve on the plate. To prevent all of this from happening, you’ll need to let the cheese sit at room temperature for about an hour or more. If you have ever left cheese out for a while, you’ll notice that a dryish skin forms on the outside. This will help the exterior to become crispy while cooking and prevent a huge melting mess. The will need to be very hot with a substantial amount of coals underneath in order to keep that heat and further help the searing process. You can either serve it as is with one side crispy or attempt to flip it. The choice is up to you. Do it right and you’ll end up with an outstanding smoky flavored melted piece of gooey madness. If cooking cheese directly on the grill seems too risky or if you decided to throw in the towel after too many failed attempts, do not despair. You can use one of those small and shallow disposable aluminum pans or create one with foil wrap to cook the cheese. The grill will still need to be super hot but you won’t have to worry about losing the cheese. As easy as it may sound, a little trial and error may still be in order because the cheese may stick to the pan making it difficult to serve. Flipping may be somewhat difficult with this method. Finally, there is one method that is extremely hard to fail, but is considered cheating. Lightly coat a non-stick frying pan with oil and cook the cheese over medium heat. Flip the cheese when one side gets slightly crispy. Whichever method you choose, try not to let one side cook for too long. If the cheese develops too much of a crunchy crust it may become slightly bitter and difficult to cut. About half of one slice is enough for one person. Eat it plain or along with a slice of crusty bread.